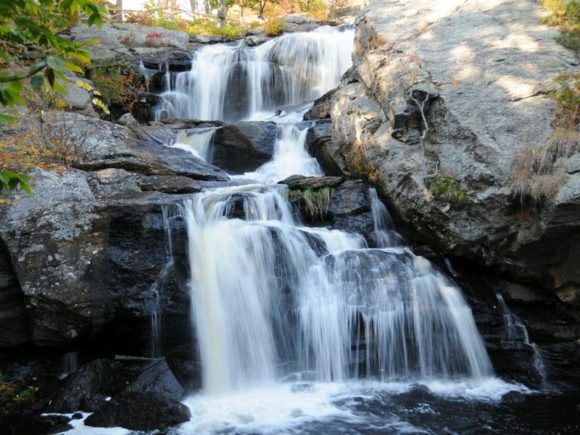 Chapman Falls in Devil’s Hopyard will be included in Prof. Gencarella’s hike. ESSEX — The Devil’s Hopyard State Park in East Haddam is one of the most intriguing places for folklore in the entire state of Connecticut. As a follow-up to the Essex Library’s folklore program on Thursday, Aug. 3, Professor Stephen Gencarella (UMass Amherst and the resident folklorist at the CT River Museum) will lead a hike throughout the park on Saturday, Aug. 5. at 9 a.m.
Gencarella will tell the copious stories about this unique location; among these are tales about the indigenous people’s culture heroes, a literary work about a wayward son, and the numerous explanations for the park’s unusual name, including the tradition of witches brewing potions in the potholes near Chapman Falls. The hike will offer a view of the valley from a cliff and hikers will have an opportunity to visit a cave along the way. Gencarella is a professor of folklore studies at UMass Amherst and is the resident folklorist at the Connecticut River Museum. He was featured in the June 2017 Connecticut Magazine in an article entitled “The Moodus Noises” (pg. 35), and is also developing a series on Connecticut folklore for iCRV. This program is free and open to the public. Call the Essex Library at 860-767-1560 for more information and to register. The hike will begin at 9 a.m. at the Devil’s Hopyard State Park main parking lot at 366 Hopyard Rd. in East Haddam. A free, folklore talk and hike in Devil’s Hopyard State Park presented by UMass Professor Stephen Gencarella at 9 a.m. Aug. 5 at Devil’s Hopyard State Park, 366 Hopyard Rd. East Haddam. Gencarella will focus on the indigenous people’s culture heroes, a literary work about a wayward son, and the numerous explanations for the park’s unusual name. Hosted by the Essex Library. RSVP: 860-767-1560.